Natural American Spirit cigarettes, often called American Spirits, are marketed as “100% additive-free natural tobacco.” But who owns the company that makes American Spirits? Are American Spirits really different or is the brand just a marketing gimmick by a big tobacco company? Natural American Spirits are made by the Santa Fe Natural Tobacco Company, which was started in 1982 by a small group of tobacco enthusiasts. The unlikely trio almost sounds like the setup line for a joke: “An author, an acupuncturist, and a plumbing contractor decided to start a natural tobacco company…” But it’s not a joke. Bill Drake was the author of The Cultivators Handbook of Natural Tobacco, Robert Marion was a hippie acupuncturist, and Edward “Eb” Wicks was a plumbing contractor who helped to secure the funds to start the company. The company sold pouches of loose tobacco for the first few years. Cigarettes were later sold as well beginning in 1985. The company’s home office is still in Santa Fe where it started more than 30 years ago, but production and manufacturing are now done in Oxford, NC. Who really owns American Spirits? Santa Fe Natural Tobacco Company was acquired by tobacco giant Reynolds American, Inc. in 2002. The company says it still operates the same way it did before being purchased by Reynolds and is an independently operating company. Reynolds American also produces Camel cigarettes. Camel’s were first produced in 1913 by R.J. Reynolds Tobacco. The history of R.J.Reynolds Tobacco is a complicated, headache-inducing story with a series of sales and mergers. The 2004 merger of R.J. Reynolds and British American Tobacco resulted in the formation of Reynolds American as a parent company. Reynolds American owns and produces the Camel cigarette brand. 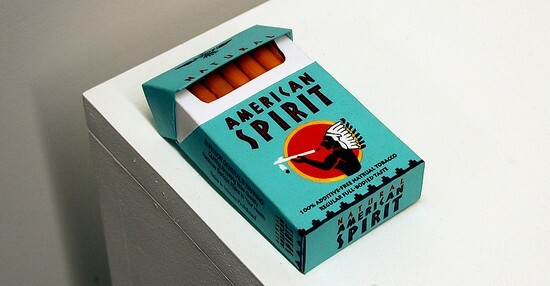 Reynolds American also owns Santa Fe Natural Tobacco Company which, in turn, produces American Spirits. It’s a complicated family history, but Camel and American Spirits are basically step-siblings in a tobacco giant’s family. Are you surprised that Camel and American Spirits are so closely related? What are your thoughts on the relation?